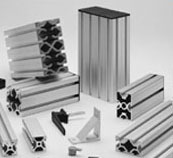 AluFab carries a large inventory of T-Slots extrusion, which includes both fractional and metric extrusion and their accessories. Our extensive inventory of the most commonly used profiles are available for immediate shipment in strut lengths up to twenty feet. Accessories, brackets, fasteners and hardware for all available profiles can be shipped from our facility within 24 hours of receiving your order.